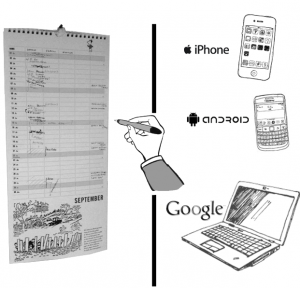 The days of writing down appointments in a calendar are a thing of the past! Be automatically up to date! 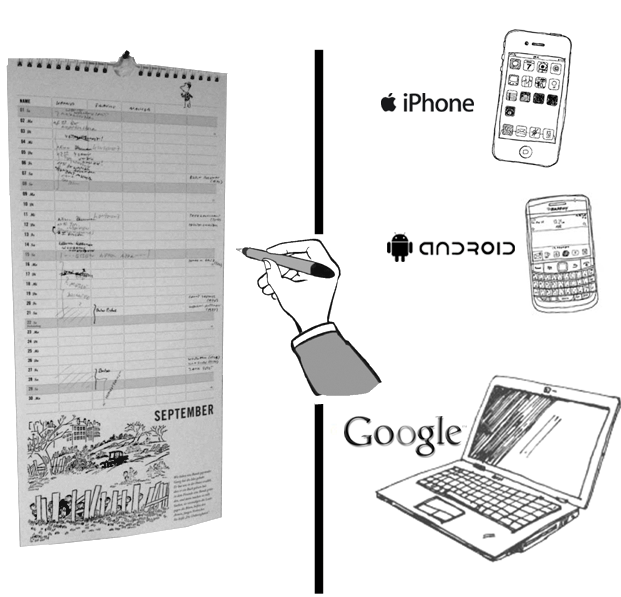 In addition to their electronic iPhone or Google calendars, many smart phone users have a paper format calendar hanging on the wall at home. In everyday use, this means that all dates and appointments have to be entered per hand in writing and then checked every now and again, if not daily. Thanks to the Calou, there’s no more crossing out or erasing things! 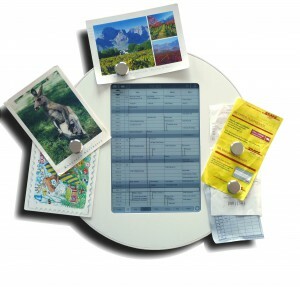 The device automatically synchronizes itself with all possible digital calendars and smart phones, and then shows the calendar contents in a central manner and location. It’s simple and lucid, regardless of whether you use an iPhone/Android, a tablet PC or a computer. The registered calendar accounts are called up per Wifi by the Calou, which then displays all of the dates and appointment entries bundled up together on its e-Paper display. Every device or, said differently, every digital calendar account has an individual column, as is the case in a traditional wall calendar. As such, every user has his or her column in which his or her dates and appointments are entered. For just about the first time ever, Apple iCloud or Google Calendar Accounts can be viewed and processed or worked on at the same time. All calendar accounts will remain completely separated and independent of each other. No calendar has to be released or shared. Only the respective calendar/account owner knows his or her own password. Every calendar account in the Calou device is technically its own autonomous entity and the unwanted use by a third party can be separately protected with an additional password. The Calou is attached to the wall much like your typical paper calendar. With that, you’ll always have all your appointments available at a mere glance. The Calou is also a magnetic board to which you can attach paper notes, post cards, or whatever else you would like. The encasement is completely made of wood and fits perfectly in the selected environment. This allows the Calou to become THE information headquarters at home where all things come together. Questions? Uncertainties? Take a closer look at the Calou! The Calou is operated simply and intuitively by hand via its touchscreen. Appointments or changes can be done spontaneously and per hand directly on the Calou. There’s no searching around your smart phone, no uploading your computer, no need to log in – the Calou is always on and your appointments are permanently visible. The display looks like electronic paper, much like the type found in an eBook reader. It uses so little electricity that you can ultimately use the device for weeks without recharging the rechargeable battery or putting in another load of batteries. As such, no fixed electricity connection is necessary. The Calou runs on typical AA (mignon) batteries that are placed in a compartment on the backside of the device. If the batteries or rechargeable batteries are empty, simply turn around the device and switch them out per hand. The Calou disposes of a micro-USB 2.0 connection for data and the electricity supply. It can also be continually connected to a power source via the USB connection, if you don’t want to operate it with batteries. Android 4.4 is the operating system that runs on the Calou. The Android platform grants you access to the Google Play Store and all of the apps that can be selected there! As such, you can actually call up your e-mail, listen to music or Internet radio via the internal speakers, surf the net per browser, and install other useful apps such as Dropbox, Evernote, and co.
Apps from the store… Or developed by you yourself?! 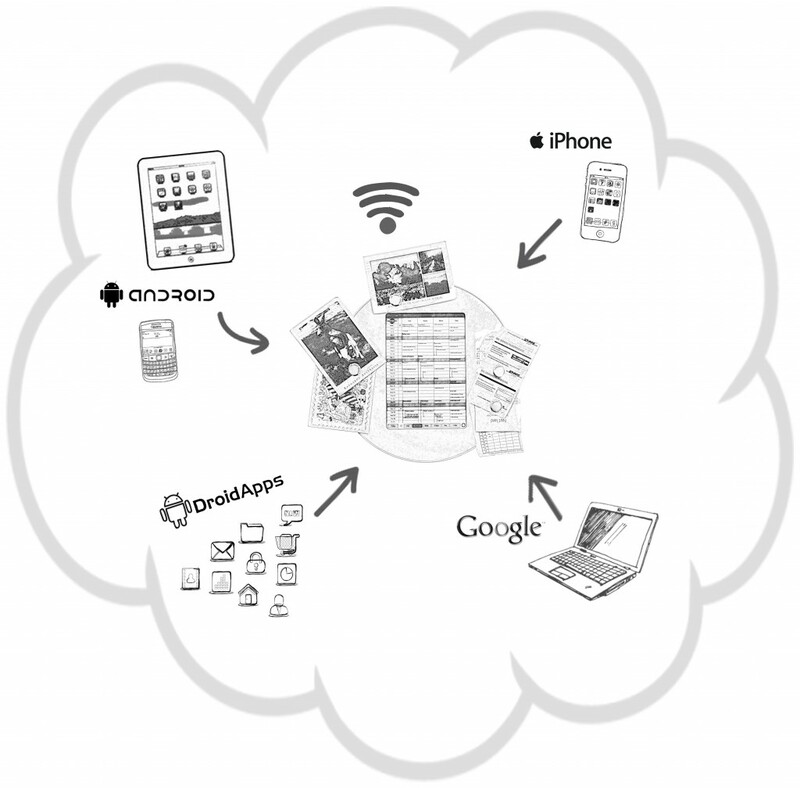 On the Calou’s Android platform, you can run and operate your own self-developed apps. You can develop special apps for your Calou and make it even better.